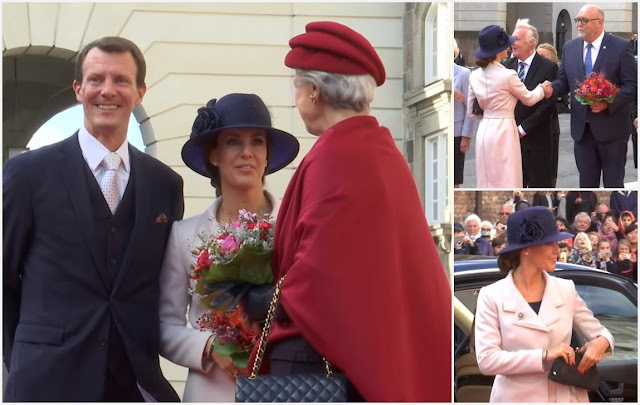 I am so interested in Crown Princess Mary's selection of purple accessories - a repeated purple Jane Taylor pillbox with a purple purse - to go with this blue-ish Claes Iverson coat. (The coat's a repeat from the Belgian state visit.) I find am now very personally invested in purple as the new neutral go-to. Princess Benedikte sported a towering pile of plain hat bases, and she made it work because she is Benedikte and this is her superpower. Look at that tilting topper and then look at Princess Marie, because do you think that her hat should've chosen either the net or the flower? I do, but I don't know which one I'd pick. I love her in a brimmed hat anyway, and I extra-approve of a hat that can cover the eyes at an event like this. You know catching a shot of the royal guests mid-blink and calling it a nap is a tradition. 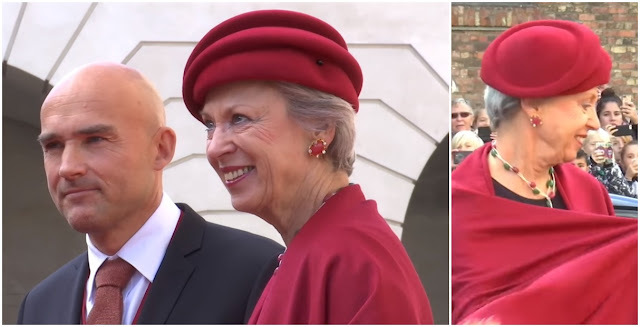 For the pièce de résistance...Queen Margrethe wearing her trademark Teletubby hat! This hat gets a little sillier every time she wears it, which is how I've come to grow rather fond of this strange little chapeau. Keep on keeping on, Your Maj.
See videos of the royal arrival here and here.